The command line prompt allows you to interact with your computer using text instead of manipulating graphics with your mouse. While most users probably don't even know it exists, the command line is very useful when you want to do something quickly like open up an application or move a file from one folder to another all without lifting your fingers from your keyboard. MCL is a command line prompt that you can place on your desktop so it's always in easy reach. It's a significant improvement over the standard command line that comes with Windows since it saves popular commands that you type in (AutoComplete) and has several other special features. 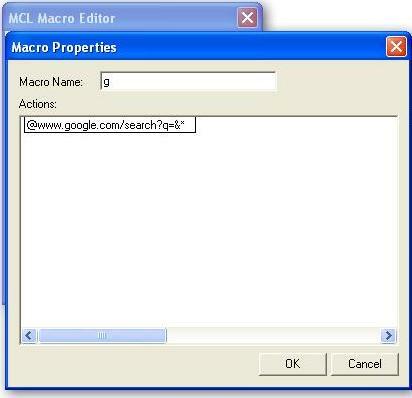 To bring MCL up, you press Ctrl+Alt+M, and a small command prompt will appear. To open up a URL, you can use the prefix @URL. Example: "@yahoo.com" takes you to Yahoo! To open up Notepad, type in "notepad". 1. Right click on the MCL icon in the tasktray and go to Macro Editor. 2. Right-click the empty list and select New. 3. Enter "g" as the Macro Name. 4. Right-click in the box labeled Actions and select New. 5. Right-click on New Action and select Edit. 6. Paste "@www.google.com/search?q=&*" into the box and click OK.
"g zune" into the command prompt and press Enter.